Sparkemail design team values the merchant's shared business information. Therefore we practice & follow strict policies taking care of the client's project. Sparkemail team believes in maintaining transparency and confidentiality, making it most liberal payment terms for the clients. If our client experience the dissatisfaction with our service, we will refund the amount, providing the valid reason. Under certain cases, client can ask us for the 100% refund. You can ask us for the refund if you experience the dissatisfaction of our services on the final product. The valid reason will be required over dissatisfaction. Any of the reason will be considered valid while client raise the refund request. If we are not able to complete the project during the given deadline, the client can demand the 100% money back from us. Also the failure to meet the standard of the project quality as promised by us can be the reason for the refund. The valid reason for how we were not able to meet the project specification from your side has to be provided. This condition will be considered valid only if the project has not begun. This can happen either from the client side or us. The entire amount of the project will be refunded to the client as the project is aborted (card/bank/Paypal account). No cancellation fees will be charged for it and the refund amount will be credited to the concerned bank/ Paypal account. You can ask for the refund even before we have sent you the complete project i.e. HTML coded and designed email templates. 1.The refund of the project will lead to the lose of copyright on the final product which can be HTML code or HTML code with design. You shall not, therefore, use it for either official or unofficial purpose. 2.We will require your approval for the design within 24-48 hours. If the approval for the project reach us after the 48 hours will be considered as the increase in the project time line, therefore will not be acknowledged as delay in project. 3.Any of the above condition will not be considered valid post delivery and the changes in the project. Maximum three times you can ask our project manager & team to make the changes/ improvements on the products matching your brand image. To know the detailed information about this condition you can contact our 24*5 development support team. We value your business association with us. Any information shared with us through any medium of communication will remain confidential & private. The shared information can be images, content, art work, design, contact information, client's details. All the information shared with us by you will be utilized for the purpose of designing & HTML coding. Your designs and complete HTML code are safe with us, sharing with none of the individual/organization. The artwork created and designed for you will never be sold to any other client. The copyright of the coded customized email design/ artwork mail will stay with you along with the other copyrights. We build association with our clients based on the trust, transparency as well as the mutual growth. We will never reveal your private information with anyone unless you decide. 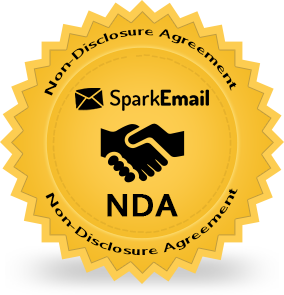 You can send your NDA to us at info@sparkemaildesign.com and we will send it back to you after signing it. Sparkemail team understand the importance of the privacy of the business information and respect the same. Therefore we never would claim the copyright on the codes and design we will do it for you. Our project manager and team will request you to share the information related to your product. Your shared information is therefore protected and maintained in the accordance of our confidential policies.